To see 2016's Winter Solstice altar, click here! The Winter Solstice celebrates the longest night of the year, a scientifically observable event steeped in lore and myth. As the longest night during the height of the cold and the snow, Midwinter creates a period of calmness and reflection before growth. After this point, the days slowly lengthen in preparation for planting and renewal. It also happens to be the sabbat most associated with the Wild Hunt. Talked about in many cultures across multiple countries and throughout history, the Hunt is a cavalcade of spirits, fae, deities and other entities that storms through the night, bringing with them a chance for needs fulfilled and taking with them the dead and lost. Its leader, the Hunter, has many faces, from Harlequin to Diana, from Hecate to Odin, and even to the faceless psychopomp who ushers the dead back and forth across the veil. 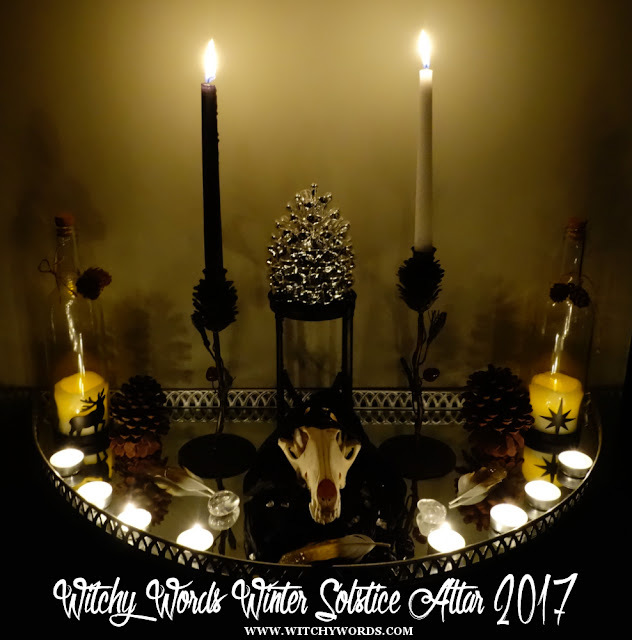 To understand my altar best, you may want to read about my solstice ritual for 2017 where my coven called upon the Wild Hunt and participated in a variety of ways. 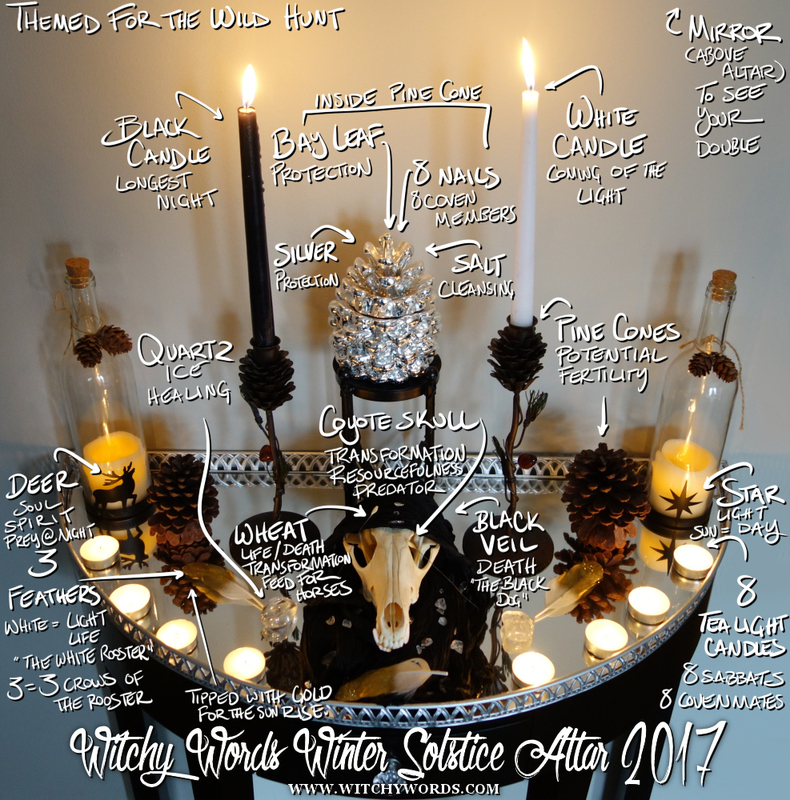 The altar begins with the centerpiece: A coyote skull dressed in a black veil, surrounded by quartz with wheat on its eyes. The coyote itself represents transformation and resourcefulness. A predator with strong connection to the spirit world, it participates in the Wild Hunt. By dressing it in a black shroud, we emphasize its connection with the Black Dogs of the hunt, the bringers of death, their bark marking the coming of the infernal ride. The surrounding quartz pieces represent the icy landscape in which the black dogs and their hunters hunt. And the wheat on the black dog's head feeds the hungry horses the hunters ride. In fact, wheat itself represents the transformation between life and death and back again. We grow wheat to cut it, then transform it into bread it to feed ourselves so we can grow the wheat again. Surrounding the "black dog" are three white and gold feathers. These feathers represent the white rooster, the gold the coming of the dawn that they call. The white rooster crows three times to mark the end of the longest night and the Wild Hunt, thus why three feathers are placed on the altar. In front of this display are eight candles. 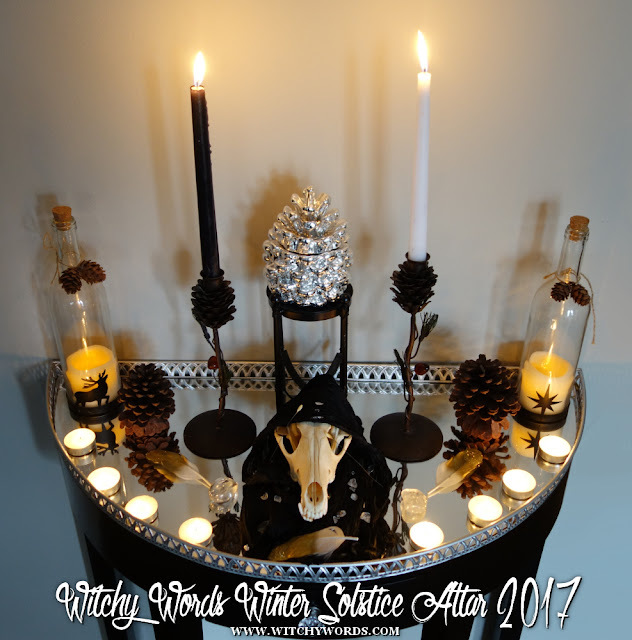 Each candle corresponds not only to sabbat we celebrate on the Wheel of the Year but a coven member who participated in the Wild Hunt ritual for the solstice. Above the altar are two candles: One black and one white. The black candle represents the longest night while the white represents the coming of the light and the lengthening of the days from here. Corresponding with the candles are the bottled candles and their symbols. On the side with the black candle, the darkest night, we have the deer - a representation of the soul and spirit, and prey to the coyote and dogs that hunt on this night. On the side with the white candle representing the coming of the light, we have a star. Stars light the way, guiding our moves. Our sun is also a star, thus allowing this bottled candle to represent the lengthening of the days from here out as well. Between the two jars and two candles sits a silver pine cone container. The silver represents protection, and pine cones themselves represent potential, fertility and infinity. The combination creates a container that can protect infinitely. Inside the container sits eight nails and a bay leaf planted in salt. The bay leaf has "Circle of Fountains," my coven's name, written on it. Bay, salt and nails are protective. This set up was to help protect my circle as we participated in the Hunt for the solstice. Above the altar, I hung a wreath with a mirror inside. The mirror was utilized in the solstice ritual as a method to connect with and speak to our Doubles - otherworldly entities that wanted to contact us on the night of the solstice. The bare branches of the wreath surrounding it represent the bare branches of the trees right now as we reach the cold of the winter nights. This altar was created specifically with my ritual in mind as a means of welcoming the Hunt to my door and protecting my coven during their involvement with it. The longest night has passed. From here, the white candle burns bright, beckoning the sun and celebrating the longer days ahead. This is breathtaking. I have been interested in your altars since I saw your 2014 one, it was fascinating! Gorgeous.